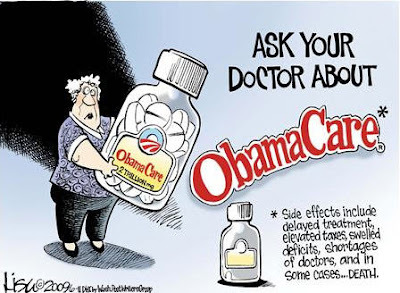 Charles Krauthammer makes an excellent case against ObamaCare - a must read. Every presidential challenger says that he will repeal Obamacare on Day One. Well, yes. But is any of them making the case for why? This is the biggest problem facing us right now. Since the economy is perceived to be improving despite a 15% unemployment rate (includes those who gave up looking for a job), and the underemployed. Since the perception, rather than the reality, that the economy is improving is taking the air out of the sails of the Republican candidates - it should force them to deal with the real destruction that is coming our way... ObamaCare. It's like an avalanche slowly making it's way down the mountain, picking up steam and enough power to crush us all. Many liberals in the States point to Canada's health care system as one we should emulate. It's not true. As an American living in Canada it's been a learning experience. To begin with we should remember that Canada has about 30 million citizens versus the United States' 300 million. That number in itself should give us pause. We should also be aware of the conversation taking place within Canada trying to figure out ways to save their system - which is in serious trouble - not the least that it is financially unsustainable. We're talking about months-long waits to see specialists and to get treatment we routinely get quickly in the States. I asked a lady in her 80s here what she thinks of the Canadian health care system. She explained that it's great until you get old. In other words - it's fine when you're young, healthy, and basically don't need more than basic care and prevention. After that, it's trouble. I know another man, in his early 70s, who had tremendous pain in his arm. He was able to see his general practitioner and get pain medication but had to wait months to see a specialist. Thankfully, his pain subsided - but what if it hadn't? What if there had been something really wrong? As it was, his quality of life was severely curtailed and he was unable to do the things he normally did during the course of his day. On the flip side of the age spectrum, I know of a baby that was in need of eye surgery. It was determined by the government insurance that it was not a critical situation. What ended up happening fell in the category of unintended consequences - what began as something relatively minor became a bigger deal. This baby, needing eye surgery, was unable to keep her balance as she began learning to walk - she then not only needed surgery, but also needed to relearn how to balance and walk properly - I'm sure needing some sort of therapy to fix the situation. I myself, before moving to Canada, during a basketball game, tore my ACL - I had an appointment with a top specialist within the week and surgery the next month... without a referral. Here in Canada you always need a referral. I wonder how my injury would have played out here in the Canadian system. In addition to long waits for basic medical care we must discuss the financial burden ObamaCare would place on the United States' weak monetary situation. We currently find ourselves 15 trillion dollars in debt. ObamaCare will cost us trillions more. To see the bill’s true first-decade costs, we need to start the clock when the costs would actually start in any meaningful way: in 2014. The CBO says that Obamacare would cost $2.0 trillion in the bill’s real first decade (from 2014 to 2023) — and much more in the decades to come. We’d also pay for this through increased deficits. Under strict instructions from the Democrats, the CBO gave Obamacare credit for over $400 billion (from 2014 to 2023) in phony “savings” that would allegedly result from cutting doctor’s payments under Medicare by over 20 percent and never raising them back up. As the CBO notes, one of two things could happen: Congress could either follow through on these severe pay cuts — in which case doctors would view all Medicare patients as if they have the plague — or, Congress could eliminate these pay cuts — as everyone in Washington expects to have happen under the so-called “doc fix” — in which case the CBO projects that this bill would raise deficits by over $100 billion from 2017 to 2019 alone. Can we afford ObamaCare medically or financially? We must all focus on the 2012 election as the one that will determine the direction our country is headed. Is it going to be one where the government controls our private lives - telling us what procedures they can afford to 'give' us, and which ones they can't - or one where we, as individuals, have control over our own lives? After all is said and done, after ObamaCare comes into effect 23 million Americans will continue to be uninsured. The argument that all of us will have insurance is simply not true. We cannot deny that our health-care insurance industry needs to be fixed - but our health care system itself is one that many across the world depend on when their own socialized systems fail them. Our health care is second to none. To destroy our health care system as a by-product of fixing the health-care insurance industry is foolish and puts us all at risk - those put most at risk are our elderly, whose care will be rationed first. Don't believe me - ask my 80 year old friend how she likes it. Actually one thing I love about the new health care is I can actually get my own. See, before a health insurance company can deny private health insurance due to previous conditions. Group plans however are not allowed to do that. So you are stuck to going to work insurance which is generally more expensive because you cannot customize it to what you need. In reality, its next to impossible to get private insurance now. But starting in April, that clause in group insurance goes to private insurance as well. That is going to save me about 600 a month alone. So before people jump on the bandwagon about this being so bad, should look more into it first. And stop watching Fox news lol.